ToughSledding on the road ahead — send money! 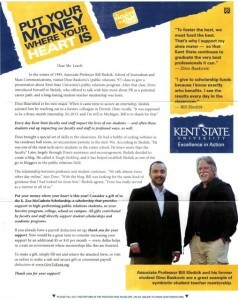 Me & Dino shilling for Kent State. Hey. It’s been a while. Not that I didn’t have a lot to say these past few months. I always do. But 2013 was one of those years when nothing went right for me professionally. So after this post on March 3, I decided it was time to STFU. You got your troubles, I got mine. Now it’s time to move on. I’ve immersed myself in creating killer content for courses in the Kent State’s PR Online Master’s program, and I’m working hard on a campaign that I hope will educate communication professionals about the injustice of unpaid internships and the legal issues surrounding them. It’s a cause that could use another voice, and I’ve decided to lend mine. I hope you’ll get on board. What really triggered this post after 3 months of silence is what I hope is a positive step toward getting my head back into the game — or at least back into my job. I’m pleased to start the year as a co-star in a Kent State fundraising campaign, along with my friend, mentor and former student, Dino Baskovic. It was Dino who dragged me into social media some 8 years back and it was Dino who served as my social-media professor as Toughsledding.com took to the blogosphere. I know you can’t read the copy on this flier — a fine story written by another PRKent grad, Danielle Hupp. But the story will be featured in Kent State E-Inside next week. Watch for it. To the Kent State faithful, this isn’t a pitch. But if you decide to open your checkbook on this appeal, please check the box for the E. Zoe McCathrin Scholarship Fund. That way, you’re helping a public relations student continue the PRKent tradition, and you’ll be serving memory of a friend and mentor who shaped so many public relations careers. I know what you’re thinkin’. Why would Kent State put a troublemaker like me in the spotlight this way? Beats me! Maybe they’re starting to understand that dissent isn’t such a bad thing after all. But whatever the reason, it’s time for a little positive karma. This entry was posted in Uncategorized and tagged Dino Baskovic, Kent State by Bill Sledzik. Bookmark the permalink. “Why would Kent State put a troublemaker like me in the spotlight?” Oh, come on, Professor. You may think of yourself as a troublemaker, but you’re truly invested in the program. You admit that your “immersed in creating killer content” for the online program. Using your image in this campaign is just another way to co-opt you. So admit it…there’s at least a part of you that enjoys being co-opted. Well, Melanie. I certainly am invested in Kent State — and it’s the by far the best investment I ever made in terms of life choices. I don’t care for being co-opted, but I also don’t mind helping raise money for scholarships. More than half of the endowment in the E. Zoe McCathrin Scholarship came from me. I urge everyone who does give to their college or university to designate those contributions to things that matter to you. Avoid the slush funds.